Tavares is the highest scoring player in National Lacrosse League history and spent his entire 23-year career with the Buffalo Bandits. Knowing that owning a Maple Leafs jersey might not sit well with Bandits fans, he avoided buying one. But now that he's retired from the NLL and his superstar hockey-playing nephew is the Maple Leafs' big free-agent catch of the summer, he might get a No. 91 for himself or his son. "My family's not the kind of family that wears that jacket or hat. We're supportive, don't get me wrong," said Tavares, who notes his son has an Islanders jersey that was a gift from his nephew. "I'm a Jays fan, I'm a Leafs fan, I'm a Raptors fan, but I don't own a Blue Jays or Leafs hat or jersey or anything now. "Now I've got more of a reason to get a Leafs jersey. (...) I see they're in print already, which is great news." The younger Tavares was drafted first overall by the New York Islanders in 2009. He has 272 goals and 349 assists in his career so far, and was the hottest free agent on the market this off-season. He signed with the Leafs as free agency officially opened on Sunday, bringing an end to a saga that gripped hockey for the better part of seven days, and built up steam during the final 48 hours as he weighed his options. "It was a tough decision for John. 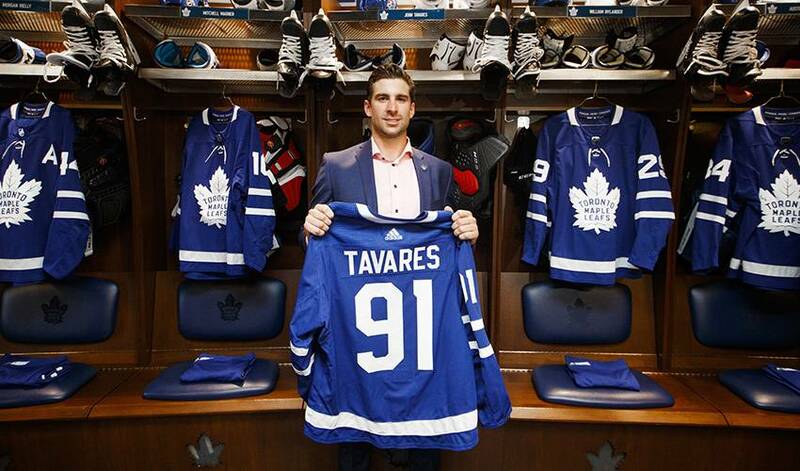 New York treated him very well, New York's a great organization to play for," said Tavares. "It wasn't an easy decision. I think he was going back and forth between Toronto and the Islanders. "I was there for moral support and making sure that he made the decision for him and no one else." The deal is worth US$77 million over seven years, with an average annual value of $11 million against the salary cap. Tavares, from nearby Mississauga, Ont., tweeted that he was going to Toronto just after 1 p.m. ET and then added a photo of himself sleeping on Maple Leafs sheets as a child. Although his nephew never confirmed to him that he was coming home to Toronto, the older Tavares had the sense that that's how it might shake out. "I actually had many people text me that 'your nephew signed!' and that's how I found out." It's an exciting time for the Tavares family, that are based in Mississauga and Oakville, Ont. "John playing in the city he grew up in is really exciting, it let's us embrace his career a little bit more, not that we didn't in New York, but with him being a lot closer to home it will be easier," said Tavares. "Most of my family members grew up Leafs fans, watching the games every Wednesday and Saturday night. "Most of us are born Leafs fans who became Islanders fans turned back to Leafs fans."